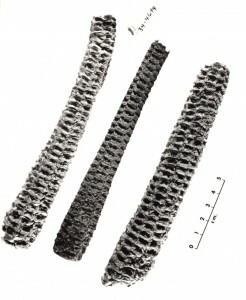 Paleoethnobotanists study the use of plants in human history. They are particularly interested in where, when, and how humans went from gathering wild plants to selecting and changing plants through domestication. Native American hunters and gatherers knew a lot about wild plants and gradually began to select and encourage plants with particular traits. For example, grains with larger seeds or thinner outer seed coatings would be easier to use as food and would be encouraged and later cultivated. Paleoethnobotanists can track these changes through time and tell if a plant found archeologically has been altered by human selection. They can track traits of domestication as well as different varieties of the same plant species geographically to trace their movements through trade or diffusion. Nut cache from Alred Shelter, Benton County. In the Archaic period, Native Americans made use of wild plants as food. Even as they transitioned to agriculture in the Woodland period, they did not entirely abandon the use of some kinds of wild plants. Nuts seem to have been used continually because they were such an easily stored and plentiful source of food. Caches of acorn and hickory nuts are commonly found in bluff shelters with radiocarbon dates anywhere from 6010 to 185 years ago. Caches like this one from Alred Shelter in Benton County are common. Acorns are often found in grass or basketry lined pits in dry parts of shelters, presumably stored for later use. These caches from later contexts, after the invention of agriculture, would have served as a secondary food source and a buffer against years when crops did not produce the expected amount due to flood or drought. Jerry Hilliard’s work on acorns in bluff shelters notes that acorns found in these caches are usually parched and concludes that this was advantageous for several reasons. Acorns need a more elaborate preparation process than hickory nuts because it is necessary to remove the bitter tannic acid they contain before they are palatable. The first step in this process may have been parching the acorns before storage and then grinding them and soaking the paste in hot water to remove the rest of the tannins as needed. They were also parched before storage in order to keep them from sprouting while buried and to kill any weevils that might have continued to eat the acorns while they were stored. 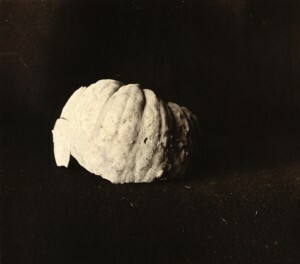 Squash fragment recovered from Cobb Cave in Newton County. University of Arkansas Museum photo 310001. Ozark bluff shelters are a treasure trove of information about plant domestication. One researcher who has been foundational to understanding food plants in the Ozarks is Gayle Fritz of Washington University in St. Louis. Her work, and that of many of her students, has focused on looking at how plant remains in Ozark bluff shelters fit into the larger story of plant domestication in the United States. The diet of Native Americans in the Ozarks changed through time as they began to domesticate more plants. Their diet included some plants that we still eat today, like corn, beans, squash, and sunflower seeds, but it also included some plants that are not in cultivation today. These staples of the Native American diet included starchy seed plants like chenopodium, amaranth, and may grass. Many of these starchy seed plants are the very weeds that farmers use herbicides to control in modern agriculture. Paleoethnobotanists can piece together the story of food plants in southeastern prehistory by dating plant remains using radiocarbon dates and then comparing samples. They are looking for differences in the form of the plant remains that can tell them if humans have domesticated the plant by selecting for certain traits. By comparing these samples of known age and region, they can tell if domestication happened in one region before another, if the same plants were being domesticated simultaneously in more than one area, or if plants domesticated in one region were brought to a new area through trade or the movement of people. For example, chenopodium samples found in several shelters in the Ozarks are clearly domesticated in form but seem to be the product of domestication in place rather than being imported from Mexico, where chenopodium was domesticated very early. Researchers can tell this by looking at the size, form, and color of the seeds. The Mexican chenopod seeds are pale and have thin outer seed coatings. Some bluff shelter examples also show thin outer seed coats, indicating domestication, but are a different color. They seem to have been domesticated in the region rather than imported from Mexico and then grown in the Ozarks. 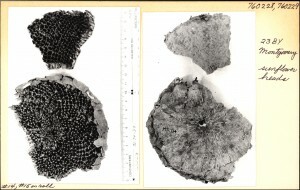 Examples of sunflower heads excavated by Dellinger’s crews from the Montgomery Shelters in southern Missouri. 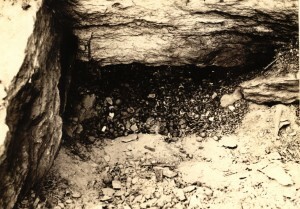 Sunflower seeds in the Ozark bluff shelters may be among the earliest cultivated in the southeastern United States. There is one date from a sunflower seed sample in Tennessee that is older than the oldest Ozark sample, but the dates are quite close. It dates to about 900 BC, whereas the sample from Marble Bluff in Arkansas dates to about 893 BC. However, the seeds in the Ozark example are much larger. This may mean that they had been domesticated for a longer period of time than the Tennessee sample, because the usual trend is for seeds to get larger over time as the larger seeds are selected for. The conclusion is that sunflower domestication in the Ozarks may be the earliest that we yet know of, or at least happened at around the same time as the Tennessee example. The earliest instance of corn or maize agriculture in the United States is in the Southwest. In the Late Woodland period corn was introduced to the southeastern United States. Through time its use increased and large-scale maize agriculture became one of the hallmarks of the Mississippi period along with shell-tempered pottery. Corn entered the Ozarks in the Late Woodland period, about the same time it arrived in the rest of the region, and was definitely in cultivation by AD 1000. However, corn cobs from the Ozark bluff shelter collections show that the size and shape of the cobs are different than both the typical eastern varieties and the Midwestern ones. There is a higher percentage of cobs with 10 to 14 rows of kernels than would be expected in other southeastern contexts, where eight-row corn predominates. This disparity makes it clear to paleoethnobotanists that corn in the Ozarks was domesticated independently. Its domestication was different in response to environmental factors and choices made in the cultivation of the plants.